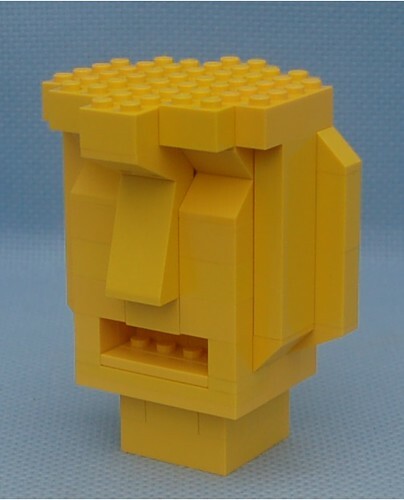 An attempt at making a Moai from Lego. It doesn't quite work. In 6P scale this would be 30 feet tall, which is close to the tallest one ever built. Excellent work. Would love to see a whole set with varying sizes. You can always use more priceless artifacts to throw between the enemy's bullets and yourself! CmdrRook wrote: Excellent work. Would love to see a whole set with varying sizes. You can always use more priceless artifacts to throw between the enemy's bullets and yourself! 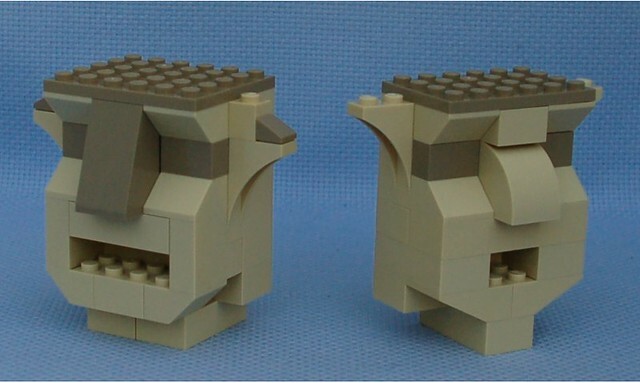 Another attempt at making Lego Moai. I'm happier with these as the color is better and I used less pieces than the last time. Loud can take five hits before being destroyed. Quiet can take six hits before being destroyed. The new ones are great. The color and variation really adds something here that the older yellow one doesn't have. Blorf wrote: The new ones are great. Thanks. I have a third that I need a few more parts before it's finished. Blorf wrote: The color and variation really adds something here that the older yellow one doesn't have. Well, yellow doesn't look quite right if it's meant to be some sort of stone. The funny thing is I'm looking at them and seeing ways to improve them and make them a little more "real". The improvements are more than just color, but that certainly helps. Big heds are big. Can do Easter iland heads? A full on Easter Island themed scenario would be awesome, I wonder if I could come up whit some heads as well. SamSam wrote: Big heds are big. Can do Easter iland heads? There's a link in the first post to the Wikipedia page. VitorFaria wrote: Those are great! VitorFaria wrote: A full on Easter Island themed scenario would be awesome, I wonder if I could come up whit some heads as well. The Heavy Gear setting also has a tradition of stone heads, which these are sort of a nod to. Stone Heads 2, on Flickr. 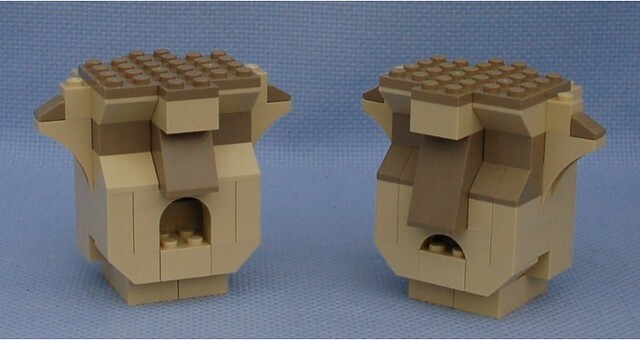 A second attempt at making Lego Moai in Tan and Dark Tan. I'm as happy with these as the last two and I used less pieces in one of them. Mouth can take five hits before being destroyed. Nose can take four hits before being destroyed. Although I am more familiar with the enlongated heads of the Eastern Island Moai statues, these one are not any less impressive. I wonder if the Aztecs had Moai statues because I think I remember seeing ones like these somewhere, but I cant remember.